We have an enthusiastic group of builders moving in this afternoon, and they quickly start finding their camp friends. Jenna marvels at the yurts from her new bunk. Devi and her sister, Kira, came to us all the way from Australia. Devi gets used to the yurt life before we meet up for our first circle. At our first circle, we get to know each other a little bit. We introduce ourselves and try to name our spirit tools -- whatever tool they relate to most. In this group, we have dremels, rope, deadblows, and chop saws. Collaborator Caroline goes over the rules of Tinkering School. And then it's off to learn about our tools! Among the many tools we use on a daily basis, the chop saw is one that requires a little more attention. How do we use it? Collaborator Rhody is about to explain. After we get our safety gear on and give our silent thumbs up, Bor chops into some 2x3s for practice. Jenna demonstrates a cut to her fellow tinkerers. Everyone seems to have it down quickly. Next it's on to clamps. Who knows what they do? The groups show off their clamping masterpieces, seeing what crazy contraptions they can come up with with all the clamps available in the workshop. Our most used tool is the power drill, which is actually a little trickier to master than most expect. Collaborator Dee shows us the importance of respecting drill bits. After all, they're spinning, twisted knives. Collaborator Kevin shows Juan what pieces of wood still need to be screwed together in their practice session, while smaller groups tackle their drilling. Armed with all their new knowledge, the tinkerers head up to some well-deserved dinner. Dee has made an excellent salad, and our cook, Paul, has made us some homemade lasagna for us all to enjoy. The lasagna is a total hit. We all chat around the dinner table, getting to know each other better and finding out where we're all from. After dinner, Collaborator Miles issues a challenge: what team of three can make a tennis ball go the farthest? The catch is, the teams can't use any power tools, but they can use any materials they can find in the shop, as well as any hand tools. The teams split up and rush down to see what treasures the workshop is hiding. We can't use the chop saw, but hand saws are fair game. Anthony is upset to find that we don't have nails to use with the hammer he found. He'll find another way to make it work! Madelyn, Devon, and McKenna work out the first iteration of their idea. What will it become? Nate and Kira work together to build legs for their sling-shot-insprired machine. 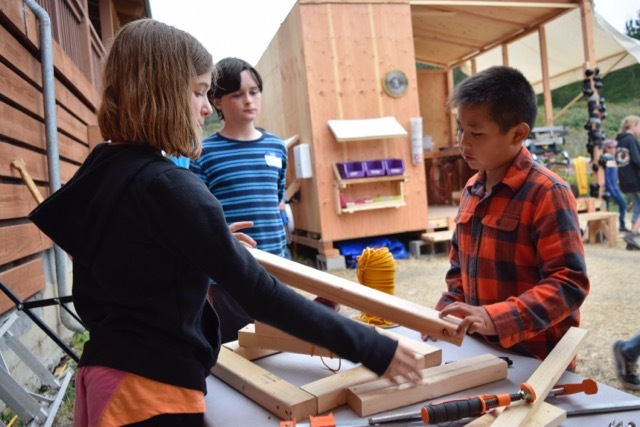 Devi, Patrick, and Hugo discuss the best methods of attaching their bungie to the wood. Mo, Bryn/Nyrb, and Victor are doing some tinkering with paracord. The campers only have an hour to complete their machines. Collaborator Miles helps do some last-minute knot magic for a group. Time's up! The fog is rolling in and the sun has gone down. Junior Collaborators Gilon and Mac walk down to bring all the kiddos up to the parking lot. All seven teams line up at the starting line with their various machines, giggling and lamenting about their lack of time to finish to their visions to their liking. Time to show them off! Team #1 is up, with Devon, Kira, and Michaela. They prepare their sling shot. Devon lets out a yell as the tennis ball flops out of the basket and rolls along the ground, and Michaela covers her face, laughing. Our first failure! We cheer regardless for their effort and good humor. Team #2 is next, and Mo steps out in front of the crowd. Their machine didn't quite come together, she explains as she holds the ball in one hand and a deadblow in the other. In her practices, she had whacked the tennis ball a fair distance, but as she swung her mighty hammer during the finals, she missed and the ball bounced away. We hoot and holler at her team's efforts. Team #3 is ready for their turn. Eve and Jenna steady the fulcrum while Juan leaps onto the board. The tennis ball flies through the foggy air and lands about 30 feet away. The best record yet! Team #4, composed of Bor, Tenley, and Nora, has done something entirely different. They built a pulley-like system between the starting line and well past the 100ft mark. This all technically follows the rules, and we're curious to see it all in action. Their tennis ball chariot drags along the gravel, but it carries the ball nevertheless. The collaborators are impressed with this ingenuity. The team manages to knock the end post over to release the ball approximately 130 ft away from the starting point. The other teams seem put out, but they carry on. Team #5 has a catapult design. Misha launches himself onto the lever, but the stick isn't long enough and the ball hits his shoulder on the way out and rolls backwards. Team #6 has an intricate slingshot. They've stolen a dinner bowl as a basket. We're all very interested. But it comes apart mid-release. It's hard not having power tools, we're finding. But there are some structural issues. Whoops! After we celebrate our constructions and have a good talk about the importance of failure, graceful failure, and persistence, we all deconstruct our projects and get ready for bed. We've had a very full day, and we have our first full day together tomorrow. In the morning, we'll talk about this week's big project, split into groups, and celebrate Independence Day with each other. Until then, Happy Fourth! Blog written by Caroline, with late-night editing assistance from Adam.